Judder News, 10/9/13 | JUDDER! We’re back from the future after a bang-tidy Robots Aliens and Astronauts Judder that saw me consume rather too much Jack Daniels’ and prance around in my best space-suit in a manner that made me wish the camera had never been invented! So far I’ve been lucky and avoided being photographed (although there are some great photos up online already) although I suspect that won’t last… Big thanks to Zaphod and Febs for emergency guest DJ duties and playing a couple of diverse sets featuring stuff I don’t think I’ve heard at Judder before (which really takes some doing..!). More photos coming soon, and if you have any to share, get in touch and you could win free entry to the next Judder! 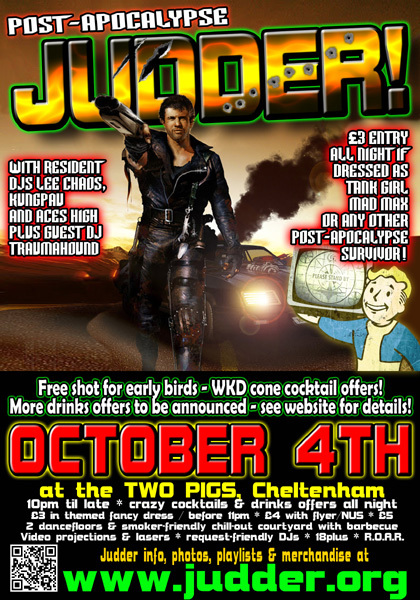 On the subject of which, we’ll be preparing for the end of the world as we stage our POST APOCALYPSE JUDDER on Friday October 4th, so come dressed as Tank Girl, Mad Max or any other survivor and you’ll get discount entry. Plus our guest DJ is the return of the ever-marvellous DJ Traumahound so it’s already shaping up to be one of those atomic evenings! If you can’t wait that long, there’s a couple of events to fill the void as my electronics side-project called temp0rary play 2 gigs in September, firstly this Friday 13th September at the 2 Pigs with support from Kenji Run, Hippy Milne and Cheyne Stokes, and then collaborating with the ever-angular Brown Torpedo headlining the Agent stage at FrogFest on the 20th September at the Frog & Fiddle. Too busy for the world to end – see you soon!